Samsung has been using 3,000 mAh batteries on the smaller Galaxy S flagships for a few years now, much to the disappointment of those who prefer a compact smartphone. However, Samsung doesn’t seem to be moved by that. A South Korean certification for the SM-G970, or the Galaxy S10 Lite, reveals the device to come with a mere 3,100 mAh battery. Only recently, we were singing praises about Samsung launching smartphones with big batteries. Last year’s Galaxy Note 9 impressed most of us with its big 4,000 mAh battery. Some of Samsung’s upcoming budget phones, like the Galaxy M30 and the Galaxy M20, will reportedly feature an even bigger 5,000 mAh battery. A flagship not worth buying? With each passing year, Samsung has been giving fewer reasons for customers to opt for the smaller of the Galaxy S flagships. The gap keeps widening and may well reach a tipping point with the Galaxy S10. Early reports suggest that the basic version of the Galaxy S10 will lose out on the triple rear camera and dual front camera setups, as well as on the curved display. The device could also be on the receiving end of a few other specs, such as base storage. And now the new revelations about its battery capacity aren’t promising either. 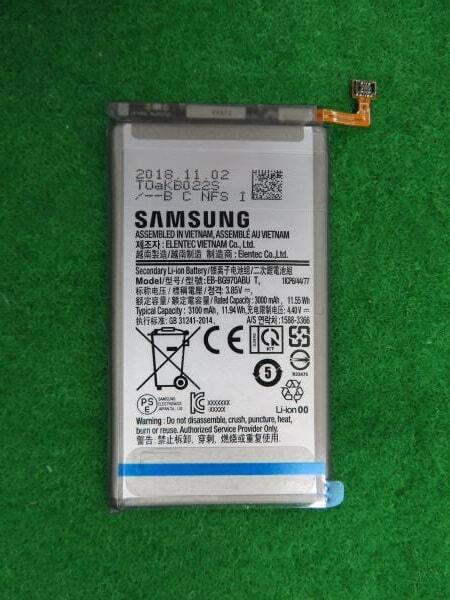 The South Korean certification for the S10 Lite battery reveals a Li-ion battery with a rated capacity of 3,000 mAh and a total capacity of 3,100 mAh, so the actual performance may be similar to the Galaxy S8 or S9’s battery. And while there’s no word yet on the battery capacities of the S10 edge (SM-G973) and the S10+ (SM-G975), one could expect them to feature a battery bigger than that of the S10 Lite. More information about these devices should surface in the days to come, as we inch closer to release. How come Samsung gets a bashing by making a phone smaller and still manage to put in a bigger battery then last year? Its not always around numbers!! It’s a lite version. If people want the better specs buy the standard version. If the lite was the same as the standard version………..then it would be the standard version and there would be no lite version. Given its overall specs 3100mah will probably be enough. The rumours have the S10L at 4GB of RAM, not 6. Apples XR has done crap in sales because of its sub par specs and performance with a premium price tag. and now Samsung are doing the same!? we do not need a “Lite” model. what is the point of the A7/A9 if the Lite is going to be more expensive and less feature packed. What! Xr performance is sub par !! Other complaints were around the single camera on the back and I m glad and hope Samsung take notes and make sure the lite has dual set up. Also their cheap 700+ price was a sore point too.